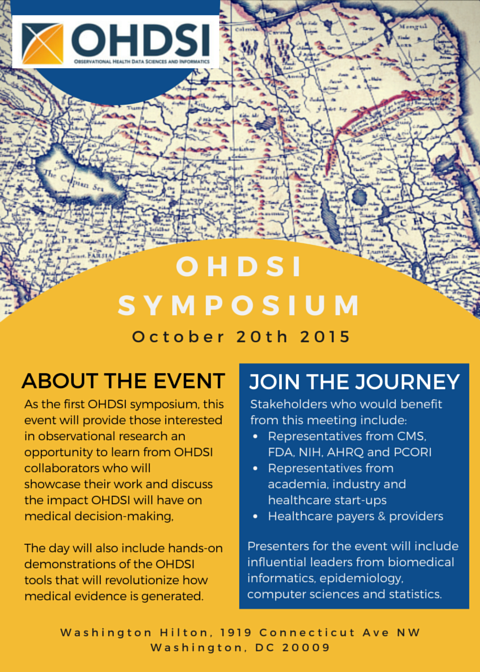 The OHDSI team is delighted to announce that our first annual symposium will take place on October 20th 2015 at the Washington Hilton in Washington DC. The aim of this event is to raise awareness of the OHDSI project, discuss the impact our work will have on medical decision-making, and unveil our research findings to date. Throughout the day, participants will have the opportunity engage in discussions with influential leaders in the fields of biomedical informatics, epidemiology, computer sciences and statistics. In addition, participants will take part in hands-on demonstrations of the OHDSI tools that will revolutionize how medical evidence is generated in a personalized manner. The OHDSI team is now accepting submission abstracts for poster presentations at the 2015 OHDSI Symposium. Click here, for more information on how to apply. Please note that registration to the 2015 OHDSI Symposium only covers your attendance. All travel and accommodation arrangements are the responsibility of each participant. For directions to the symposium and nearby hotels, click here.